Duchess Kate: Family and Friends Gather at Kensington Palace for Prince George's Birthday! Family and Friends Gather at Kensington Palace for Prince George's Birthday! It was quite an unusual day at Kensington Palace as the Royal Family celebrated Prince George's birthday. The day no doubt began with various preparation for the party; icing the cake, preparing food and ensuring the children had plenty of activities to keep them entertained. Earlier, Kate and Nanny Maria Tereasa brought George to Buckingham Palace to see his great-grandfather Prince Philip, who was unable to attend the party due to other commitments. 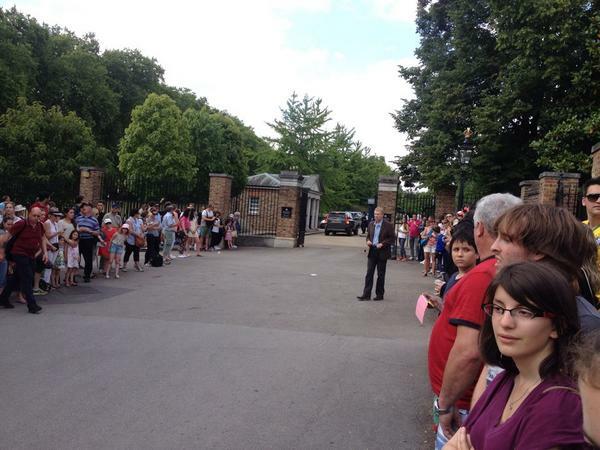 In the early afternoon onlookers began to gather outside Kensington Palace to see guests arrive. According to one observer there was "a fabulous atmosphere and a sense of excitement in the air as the future king marked his first birthday. It was a beautiful day and all the guests looked very happy as they drove past". As expected, the party was a small affair including only the couple's closest family and friends. Mike and Carole Middleton were among the first guests to arrive; they travelled separately. Pippa, who just completed the Bosphorus Cross-Continental Race, arrived solo for her nephew's party. It is thought the author played a large role in organising the event. James Middleton followed closely behind. It is rumoured James was accompanied by his TV presenter girlfriend Donna Air. William's cousin and George's godmother Zara Tindall was all smiles as she drove past with her husband Mike and daughter Mia Grace. The young royals' closest advisor Jamie Lowther-Pinkerton was there too. 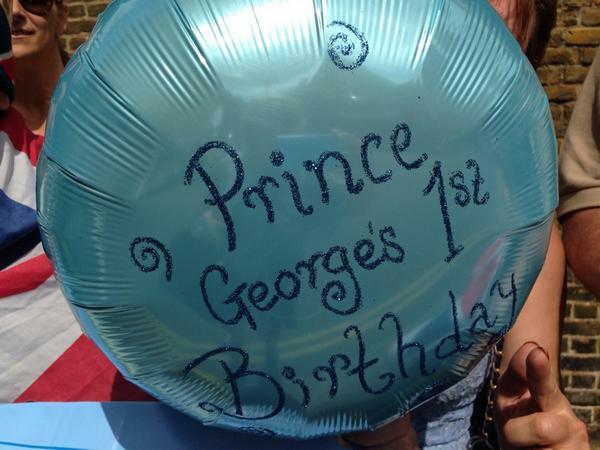 As someone who has played such a significant role in guiding the Princes in recent years it would have been quite special for him to see his godson George turn one. William and Kate's close friend, and another of George's godparents, Emilia Jardine-Paterson was also there with her baby. 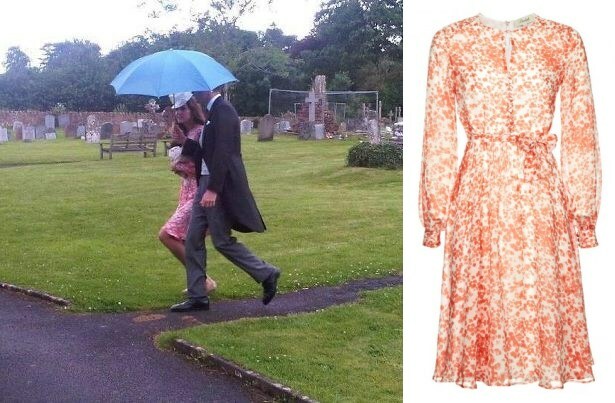 Fashionistas will recognise Emilia's dress as the Beulah London Blossom Dress; Kate also owns this dress and wore it to Alice St John Webster's wedding in 2012. It's a beautiful piece and perfect for the occasion, which leads me to wonder: what did Kate wear today? No doubt the event got underway after the guest of honour, Her Majesty The Queen was inside the palace. Despite her very full schedule I thought it a lovely gesture she made time for her great-grandson's first birthday party. Charles and Camilla were otherwise engaged with royal duties. 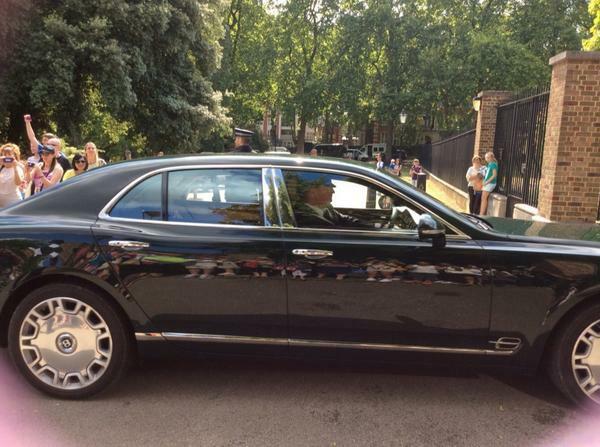 Prince Harry was reportedly there too, and the van Cutsem's were spotted by onlookers and members of the press. It seemed a perfect celebration for a one-year-old with family, godparents and a couple of little playmates in attendance too. 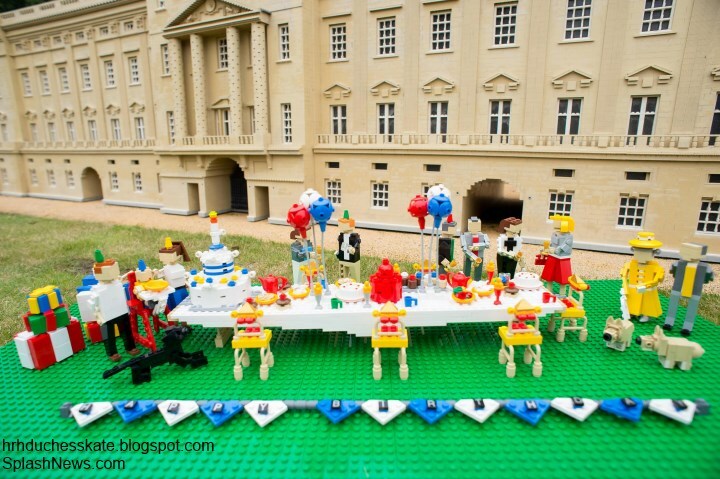 Since we wont be seeing photos from inside, we leave you with a look at Legoland's interpretation of Prince George's birthday party. A miniature Buckingham Palace was recreated with a traditional garden party for the prince. If you look closely you'll see a cake with one candle marking his age, balloons and birthday presents. I hope it was an excellent day for all in attendance and a fun one for Prince George! I also spy a Lego Lupo and the Queen's corgies. And a redhaired Prince Harry, and the Queen in yellow behind the corgis. I think George is looking over his pile of wrapped presents. Very cute! 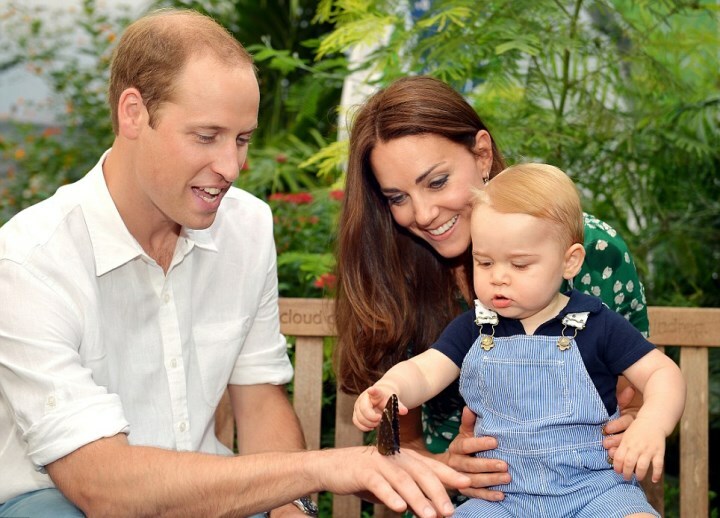 Yes, now I see George is in the high chair, with Kate on one side and William on the other. Who do you think the very tall figure in the red skirt is? Dame Edna? Hope George had a lovely time. I wonder if at the palace George watched the Changing of the Guard as "Sky" reported that the band played "Happy Birthday". Just been watching a programme on "Sky" about George's first year--nothing new for anyone following Charlotte's blog, but nicely put together.Thanks for this blog Charlotte---hadn't expected anything new tonight. Hi Jean, hope you are well. I'm throwing a British themed Bridal shower for my soon to be daughter in law. She loves the Royal family too. Scones, Toad in the Hole, California Strawberries and tea. Someday I'll make clotted cream :) in a talky mood here. George is Absolutely adorable. What a delight! What a great idea, Sarah! Would there be fruitcake, by any chance? Don't forget the cucumber sandwiches! Have a lovely time. Potted shrimp is quite nice served with toast if you want a more substantial tea. All this food talk is making my tummy grumble. Which now has me thinking about a traditional English afternoon tea. "What really is a traditional English tea?" We're familiar with all the nibblies that are so popular amongst the hotels and famous restaurants which now serve high teas, and all those "Afternoon Tea" cook books. But what do you get if you were to knock on a thatched cottage door on a cold, windy afternoon and be offered a traditional country tea. I have no doubt a tea cake and tea properly brewed in a pot and even LEO's potted shrimp on toast. Cucumber sandwiches, maybe not, as too high end. A sandwich would most likely be a thick loaf of home made bread with lashings of butter. I'd love to try it one afternoon. Thank you, Charlotte! What nice pictures and list of guests. So nice to know there was a great party outside the palace as well as inside, and at Legoland, too. Hard to believe that Prince George's paternal grandfather could not find a way to attend, but it's nice that he got to visit his great grandfather on his special day. Thank you, Charlotte, for the lovely post! Happy Birthday dear little Prince George!!! It seems as if Beatrice and Eugenie are not really close to Catherine. I have read articles in the past that referenced some tension there. Thought that Sophie and Catherine were seemingly close. Maybe they had engagements also. As far as Charles having engagements, it would seem that he could have had his grandson's birthday blocked off on his calender. But that's just what I would do. Oh well. The photographers just stood outside the gates of the palace to take the photos. The opposite side of the palace is a park so cars can only enter from one side. Prince & Princess Michael live at KP. They just could have been coming home around the same time. Doesn't mean they were invited to the party. I admire Charles for pertaining to his engagements. But, one wonders if he doesn't like to be upstaged....(by his grandson/son/daughter-in-law etc.) Perhaps he feels it's a bit of a 'Middleton-event', who knows??!! Prince and Princess Michael live at KP. Could that explain the photo? It is odd that they would attend since it seems like a small gathering by royal standards. Sophie and Edward I am not surprised about. They may be friendly with W&K, but I don't see them sharing a bottle of wine behind the scenes. Beatrice and Eugenie...I agree with Nancy's assessment. Don't see the love. Sorry. Charles...don't see it being a setting he would thrive in. And I'm glad that Camilla had a busy day. Very glad. Prince & Princess Michael live at KP also. So I doubt they were inviited to the party but was just returning home. Princess Michael was overdressed if they were off to George's party and not coming home from elsewhere. Even the Queen had no hat. I loved HM's new hairstyle. Very nice post, Charlotte, it sounds like a wonderful party. I too doubt Prince and Princess Michael were guests. She is wearing a hat which none of the others are. I suspect they were just returning home from somewhere. They are all very brave to drive in London. I hate it with the dreadful traffic and the congestion charge issues and avoid it at all costs. The Wessex family were on holiday at the beginning of the week, so may only just be home. The Earl also will be at the Commonwealth Games for most of the time. Sophie and Edward along with their children are away on holiday in Ibiza. There are photos of them from a couple days ago on the beach if you google. I believe there is tension/dislike between Kate and Andrew's girls. Quite obvious in some photos/videos out there. I believe they only see each other when obligated to. I 100% agree; Charles could have booked the day off. But he also missed William's first birthday, so I guess he isn't one of those grandparents that see's grandchildren as "take 2". Is it just me, but I find it very weird that the party was on a week day, even though it was his official birthday. Or maybe that's just because us "working" schmucks host birthday parties on weekends due to work and not enough time in the evening. royalfan, I really really hope that William and Kate let George forge his own relationship with Camilla. My inlaws are a divided family and as such I do not have relationships with a niece and nephew because someone else decided what it should be. Why should George be denied someone who is by all accounts a very loving grandmother? AnonLeo! Prince Philip blames the congestion on the TOURISTS! Sophie and Edward were on holiday at least as of three days ago near Ibiza. Princess Eugenie lives and works in New York City now so I would expect she's working at her job. Princess Beatrice has a job at Sony Pictures in London so it's to be expected she was at her job as well. The Kents live at KP, perhaps they were just on their way home. Zara and William have always been close so it's no surprise the Tindalls were there and Zara's career training and showing horses would allow her to be there. Ironic (and sad) that some of the same people who scream bloody murder if a syllable of non-praise is uttered about Kate have no problem sniping about other members of the royal family. Well, bluhare, George *has* been denied a very loving grandmother....Diana. You surprise me, royalfan. George had nothing to do with any of that. I think I need to bow out of this now. 4:24p.m. Good thing he wasn't born at 4:24a.m. HA! Hope Carole doesn't read your comment at @2:00. Helen, I have no problem with Carole. None at all. :) Privately, I've even joked that she should be W&K's PR person as she would have their best interest at heart. Aww: I hope the little man had a great time at his party. Thanks Charlotte for posting. Lovely, quite lovely indeed! I wonder if the Prince and Princess Michael were "there" or whether they were just entering KP. Don't they live there? I can't imagine P&P Michael going to George's little party, if they did then Princess Michael was certainly overdressed. They do live very close to W&K so I bet they were just coming home from another engagement/luncheon and got caught in the hoopla surrounding the party. It's nice that Kate took George to see the Queen at BP; a very respectful and traditional gesture, I think. And kudos to the Queen for travelling to KP. Overall, the guest list seems just right for a one year old future King. :) Oh, to be a fly on those freshly painted walls! I so agree with you, going to BP to see Prince Phillip who couldn't attend the party was such a nice gesture on Kate's part. I wonder if her and George had a dip in the BP pool after the visit? Great post again Charlotte. Thanks for your hard work. You're back, Pauline! I don't think I have seen your comments for a while. 'Welcome home' as the song goes. Anon, London Just stopping in. Life is taking me in different direction. Not allowing me much time. OK, Pauline. People were wondering where you'd gone & said they missed you. Hope you are fine. Hey Pauline how are you??? ?Long time!! This is truly a great blog, well done Charlotte! It's fascinating reading the comments, posting them, getting involved in discussions. There's quite a lot of detailed analysis going on here, and really well-thought out arguments! It's brought a lot of people together. Anon London -- Yes! Absolutely stellar! Anon London- Yes we have a wonderful little community here. We have great debates sometimes (delightfully cordial for the most part), and there are some tremendously intelligent posters here! I enjoy my little blog family very much and I hope you continue to comment as well! Very nice to meet you! Jo- Very well said my dear! Oh come on. Charles should have made arrangements to attend his ONLY grandson birthday celebration. Edward and Sophie were not at the christening either. I wonder what that is about because their daughter was in K&W wedding. It is obvious that W&K have a good relationship with his cousin Zara. As for B&E, I wonder what is the cause of that "tension". Think the Princesses look down on Kate? Charles could have, but I'm not shocked that he didn't. And I'm not saying that to be critical here; I don't see him being comfortable in that setting and he may prefer to see his grandson in a quieter setting. Lady Louise was in the wedding party, but that doesn't necessarily mean that W&K and E&S socialize above and beyond the more traditional family gatherings. Bea and Eugenie...I don't think they look down at Kate; I think they may be resentful of her. Interesting you bring this up. Sophie, Edward and their children are actually away on holiday at the moment in Ibiza. There are photos of them on a beach if you google her name from a couple days ago. We can only speculate that this shows they are not close with William and Kate because they did not plan their vacation after George's birthday. It does show that they are not the best of friends either way. Beatrice and Eugenie are a whole different story. If you google "Princess Beatrice" right now the top news story is "Princess Beatrice Hates Catherine, Duchess Of Cambridge". I am sure this is all just gossip but it is fun to read :) I am not sure what to believe! I don't know what the heck the deal is with those two and Kate, but something went down, I'd bet my secret decoder ring on it. I personally think it explains their outlandish outfits at the wedding. And the story making the rounds is Kate took George round to see Philip who had engagements that afternoon. Charles's engagement may have been planned a whole year ago while everyone was on baby watch! Re Beatrice & Eugenie-- they should try to be nicer to Kate-- as I say below somewhere--Kate' future is different from theirs! cannot really afford to be snooty to the future Queen Consort! The DM had Sophie Wessex in Ibiza in a red bathing suit and Camilla Cornwall in Scotland sitting on some lucky man's lap to off-set the birthday party news and explain what kept them from George's celebration .I used to solve the who to invite to the party without hurting feelings or stepping on egos by holding a small party in the classroom. Cupcakes and lemonade. I think just inviting the Christening group would be a similar solution.
. Did not see Charles or Duke of E. Hope he is well. The Queen did not look her best self. I had a whole scenario worked out that DofE was ill, until I read the Queen's winning race horse was involved in a possible tampered-feed incident. Hope that lovely horse is ok.
marg, yes, perhaps it is. What are the ODDS of those two comments posting right next to each other? What fun!! Bluhare- You know, I think you may be on to something there concerning Catherine and B&E, that would explain their attire at the wedding completely. To be honest, I haven't been able to keep up with the RF news lately, I didn't know they had any differences, but it really doesn't surprise me. In my opinion, they are jealous. Jealous of her status, because they were born into royalty, and she married into it, and yet she is much more popular than they have ever been. I could be wrong. But I agree with you, it does seem like something happened. Jo- I agree completely! It really isn't a smart thing to be snooty to a future Queen Consort, someone they will have to curtsey to one day! Jenn NC - what do you think will happen when/if Kate becomes Queen consort? bluhare, I never thought of it that way (that B&E dressed that way on purpose). I just assumed it was more of the same...mom's fashion gene. Thank-you, Charlotte, for taking the time. Love the Legos! Also, the nanny was smiling! What a relief. From some of the pictures of her with a grim, sour expression, I had visions of poor little William- I mean George- well, I am so glad to see this side of her. Looks like it was pretty much the Christening crowd. Yes, She looks Miss Rotenmeyer, did you see Heidi?? Many times, Esti. Don't remember her, but I can imagine. Pippa's skin looks awful, she needs to keep out of the sun I think. She really does. Her and her sister need to stop sun bathing. It is aging them badly. I agree. A lot of sun damage there. As a skin cancer survivor, I worry for Pippa. Her skin seems to have some sun damage already and she is so young. I hope she uses some really good spf on all her outdoor activities. Years ago, I remember seeing "older" and very tanned women at the pool--and realizing that their skin looked like wrinkled paper bags! That's why I look like oatmeal! I agree, complete and total sun damage. And I'm sure that bike ride across the U.S. didn't help. I think it is disgusting Prince Charles did not go to Prince George's 1st birthday. However, I am so happy to see all who went and all their smiling faces. I am sure George had a beautiful birthday. God bless him and his parents! The royals value duty above all else, including personal sacrifice. At least the Queen and probably Charles do. Not sure about the rest. Just because he did not go to this party does not mean he did not celebrate George's birthday. Interesting that Charles did not have the date marked off on his schedule. I went to the Queens Garden Party in June and took some great photos of Kate and Eugenie chatting. They both looked lovely and were having a good time. That's nice. Maybe they've mended fences as I do think there was some frostiness there for awhile. Especially with Beatrice. Thank you for that bit of info Ali! I just commented above that I did agree with others and thought there was some tension there, perhaps I truely was wrong. And congradulations on being invited to the garden party! I bet it was so fun for you! Some of what B&E may feel is human nature, isn't it? They were born royal and here comes this outsider who makes the cover pages and is destined to be Queen. Meanwhile, their Uncle Charles wants to downsize the family firm and they are being pushed farther from center stage. I wonder if C&C might have something planned with W&K&G for that evening? They are very close to W&K ... perhaps those who could not attend during the day might be attending something this evening or on the weekend? I know our family celebrations are not always clean-cut ... there are often small additional celebrations, people dropping in for a drink with a gift because work (and in the case of the UK Royals - duty) meant they couldn't attend. I think the most important thing is that George is loved very much by his extended family. Very true, Jenny. Some years I have baked three different cakes for 3 different occasions for the same birthday child. Why not? Jenny - C&C are in Scotland for the week of engagements. Charles was presented yesterday with a large toy squirrel for George and Camilla was presented with a tweed teddy bear for him. I too thought that they could have been at the party yesterday and departed for Scotland today to coincide with the opening ceremony of the Commonwealth Games which they are suppose to be attending with the Queen tonight. Charles and Camilla are in Scotland for their official annual week in Edinburgh. But I still wonder why that wasn't planned around Prince George's birthday. The Queen is now in Scotland also; she opened the Commonwealth Games in Glasgow today. Excellent post, thank you Charlotte. I love, love, love the LEGO, I hope George got buckets of it for his birthday and before. It could be why he has such nimble fingers, he could be used to picking them up.. I think it is hard to be certain who attended and who didn't, especially if there are more than one entrance. Her Majesty looks fabulous, and I loved that Catherine went to visit Prince Phillip. Nanny smiling, fantastic! Well, a good day really, I hope they had a lovely celebration, and I have no complaints! Florence, I totally agree. There is no way to know who actually attended the party beyond the people captured at the entrance. And furthermore, there is no way to know who was invited either. I wouldn't jump to conclusions regarding the Wessex's, York's and others. There may be many reasons why one was invited but didn't attend and it doesn't necessary need to point to a problematic relationship. Exactly Anna, maybe they spent all afternoon on Skype with the absent relatives, what do we know!?! The point is, no matter how much Skyping, no matter how many little private parties with Grandpa Charles and Step-grandma Camilla, I doubt any of them will involve the Middletons. That is the difference. No matter how you spin it, it is not OK.
Can we honestly compare the position Charles has, over the Middleton's lifestyle? I don't think it's fair to do that. The families are "poles apart" in many ways. I still don't think it's a major issue that Charles wasn't there. How many of us have/had spouses who need to jet off at the 11th hour for some major meeting overseas to miss a child's party? My husband is in the medical field and has missed many due to late hours, on-call etc. Yes it can be disappointing but it's not something that we need to continually nag about and put a damper on over the celebration. If C&C were doing this on a very regular basis, then there would be cause for criticism; but at such an early part of the picture, I honestly do not think this should be a condemnation on their grand-parenting. What would you have preferred Marg? 1) not condemning anybody's grandparenting. Not the issue. See 04:45 comment. 2) not sure what is meant about the relative importance of the Cornwalls and the Middletons as family.Helen- are you actually saying Charles's position makes him too lofty to socialize with the Middletons.? 3) i f the queen wasn't too busy to show up, then why C&C? The Queen saved the day. .Missing a one-year-old party was not the issue. I am getting very tired of classism and people looking down on the Middletons. Make a close comparison of Camilla's family background, compared to Mr. Middleton's . There is inherited versus earned distinction...No one has a right to make sneaky comments that serve to denigrate that family. I declare open season on the Middleton family has closed. I agree it would have been terrific to have seen Charles and Camilla come to the party. You are of course right about Camilla's background. And the Middleton background. Very valid and strong points made there Marg. I didn't say that the Middleton's and Cornwall's cannot mix. As a matter of fact, that is what I gathered from your comment @ 4:45 - which is why I'm of the opinion you cannot compare one's lifestyle to the others. Their lives are so different, but I did not stipulate they cannot socialise together. The Prince of Wales and his obligations are very different to the Middleton's family business. The Cornwall's are very public figureheads with a very full public schedule. The Middleton's are self-employed with a flexible work schedule. Some work may be allocated to a handful of staff back at the "office". Their lives are "extremely" private and they are very free to choose to do as they wish. I couldn't say that this applies to the Cornwall's. So, yes it is, and will always be, easier for the Middleton's to run to W&K's side as has been proven in the past - and they are lucky to have that support. This will prove to be a bit trickier with the Cornwall's given the level of public duty. If we don't know the full story of why they couldn't jump onto the helicopter, then we can't judge. Some comments do make out that there should be no excuse for missing out on a grandson's birthday. This is where I disagree. Some excuses are valid. And since we do not know what the reason is behind the decision, then we shouldn't judge. And nowhere do I even subtly hint that Charles is "too lofty" to socialise with the Middleton's. In this modern day, anything goes. I like to think that the English aristocracy do mix, mingle and marry into the middle/upper classes quite successfully; but it has proven to be hard work. I recently read "Snobs" by our wonderful Downton Abby writer, Julian Fellowes; and he certainly sheds light on what goes on behind the scenes in the grand English houses particularly when an outsider enters the family. A very humorous, light hearted read. Thoroughly recommend it. marg, I didn't read Helen's quote that way. His calendar is set months in advance and, yes, he knew it was his grandchild's birthday but my dad missed some of his grandchildren's birthdays if they were during the week as well. His job required travel and he couldn't schedule it around a child's birthday. So we had parties on the weekend so dad could go. So, no, I don't think it was because he won't socialize with the Middletons. The Queen was there so I don't think there's any social problems. George might have had two parties. One on his actual birthday and one when Charles could go. What kid doesn't like two parties when they can get them? Dad's grandkids didn't care because they had a great relationship and dad was there for them no matter what. George is too young for a relationship like that yet, but who's to say it won't happen. I can't believe the to-do people are making because Charles wasn't there and was working. Philip was working too which is why Kate took George to see him in the morning. Charles was in Scotland so that wasn't possible. Class distinctions do still exist among the royal family's set. Otherwise, when you think about it, how to you justify a royal family you bow and curtsy to? It implies a level of deference others don't receive. I don't think if you asked her privately, Camilla would see her family background as that close to Michael Middleton's. Publicly, the royal family has been very inclusive of the Middletons (and more quietly with Sophie's family) but I would be amazed if it extends much beyond show except for William. This isn't a criticism of the Middletons. I don't like class distinctions either. And if you go far enough back, most members of the nobility had pretty common origins. But there is no point in pretending classism doesn't exist and from what I've read, Charles and Camilla may be top of those who want to preserve it. I think this is starting to change though, particularly as young royals marry without regard for it. Exactly how that ties into keeping royal families though, becomes a question. Thank you Charlotte for a fun post. There are photos in the media of a happy Charles accepting a huge red squirrel for George so I think Jenny Australia is spot on when she says that there are likely to be other family celebrations for George's birthday. As for the Wessexs - aren't they on holiday in Spain? I'm sure I've seen photos of them at a Spanish beach in the last couple of days. Pauline, thank you for commenting on this special day. I hope you will comment again from time to time. Wishing everyone a lovely Wednesday! The Commonwealth opening was not on the 22nd. In this day and age, there are such things as private royal helicopters to speed the Cornwalls back to their tweed factory visits, etc. There were no doubt private pictures taken to mark the occasion. I'm afraid one day George will see those and wonder, too. The bright side is- look at all the sympathy back-lash for Charles. He's actually won this round. No one really thinks the Middletons were being pointedly snubbed? 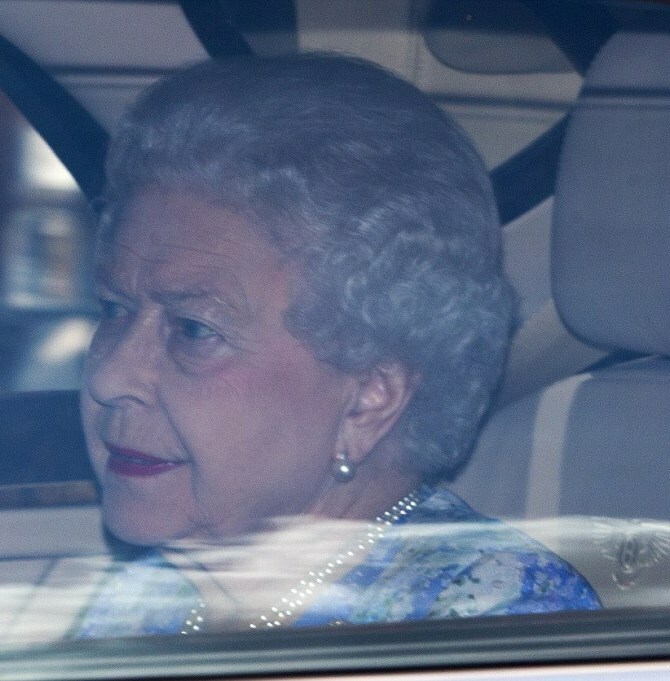 When did the Queen's plans to attend become known? Not in the royal diary? Perhaps she saw the potential for the public's seeing a royal snub. Very cynical Marg, is it the Camilla factor that makes you think that? Florence- I am sure Camilla enters into it somewhere. I still wonder what would have happened if Diana were added to the Carole, Camilla mix. Sometimes I can't help returning snark for snark. Hope I got it out of my system for now. So much for guarding my buttons. What if C&C didn't attend because of potential response had Camilla been there? I think occasions like this are a vivid reminder of Diana. I also think that this story (link) may have changed the "climate" behind the scenes. I haven't seen Kate were her "C" charm bracelet since this story came out.. Yet she's criticized for wearing the same pieces over and over. BTW, I don't think the Queen stepped in to save the Middleton's. I do believe that she is sensitive to William's feelings and wants to do the right thing....vs. the way his mother was treated in her day. I think there is definitely room for cynicism ladies. And sometimes we just have to let it out..
Do you think the Cambridges are keeping George from Camilla? It might just be too painful for them now with Diana not there and Camilla as the "step" grandma..
And if he took a helicopter to a child's birthday party the hubbub would be huge. Wasting taxpayer money and all that. It's nice that all of you have the luxury of attending every single child's birthday party no matter when it is. Some of us aren't so lucky. Even my nephews' parents missed some birthdays because one or the other was traveling and I believe Charles and Diana missed William's first birthday too. I think we all agree the C & C bracelet was a rather strange and pretentious gift! As I said at the time, I loved my mother-in-law dearly but I would have been startled if she had given me a bracelet with her initial and mine, rather than my husband's and mine. (Although Mummy-in-law and I shared the same initial like Camilla and Catherine.) The crown symbol removed the idea Camilla was making a pun on the two mother's name - Camilla and Carole. It was frankly a tasteless gift -and I think Kate has avoided it although it may have to make another appearance eventually. I do feel from what I've read that Charles is very snobbish and I think Camilla may encourage that. (Sorry, Bluhare.) I remember seeing photos when I was young of birthday cake being passed around on a flight to Australia for a royal tour of Charles and Diana. Diana had come out and was sitting with the staff members chatting with them. Charles was lurking by the curtain that separated the royal couple's area from the other, clearly unwilling to mingle further. From "Not in Front of the Corgis" it's worth remembering that some staff members like the distinction to be preserved, because royals who are friendlier like Diana and Sophie and others (those from commoner background particularly) tend to turn it on and off; being very friendly, and then suddenly drawing the line, making it unclear how you should behave to them. It does make sense that it is easier to know where you stand than suddenly feeling you have gone too far. I suspect this may become a big issue with William. Already there was some criticism when the couple where in Wales because Kate didn't mingle with the other wives. It becomes a problem when you want to be "normal" but only on your terms. I think Prince Michael has a granddaughter George's age maybe they're there with her? Sorry, but I'm a little bit confused by the comments here wondering why certain people didn't show up, like Prince Charles and Princess Beatrice. What time was the party? If it was in the afternoon, isn't it safe to assume that most people were at work, and hence that's why they didn't show up? If it was a mid-week afternoon party, I'm surprised that so many people did show up. How were Pippa, James and the rest of Middletons able to get time off their jobs? Brina, maybe they popped in whilst on a lunch break. That could explain why they arrived separately. Anyway, they run their own business so they are likely to work late evenings and weekends. Success like that does not come from doing nothing. I am referring to the Middletons. Marathons! How DOES she DO that!!??! Jo, Pippa probably made a bit of money from the recent interview. And she does work for her very wealthy family, I do not think money is an issue at all. She can do all the charity she wants to and keep fit. Pretty nice life actually! A great many people are related to royalty, some more directly further back than the queen. And inheriting money hasn't much to do with it, or even having loads, although some members of the royal family is pleased enough to take perks from them. It is a much more elusive situation of connections. I doubt they would see Michael Middleton as a social equal if it wasn't for Kate. Granted, I think MatildaSoBlue is negative in a lot of the comments. BUT the video does show that at least Kate feels snubbed (especially the way she looks back). And I believe that she would feel snubbed, because she's already feeling sensitive about tensions/attitudes/wtvr. Why do girls have to be mean to each other?! Only the very insecure ones are nean to others. You never see secure people treating ANY others abusively. I remember your advice from last post Florence :), I am ignoring that anon this time. The poster said right out that there were negative comments, and also said that the video shows how Kate appeared to feel snubbed by the expression on her face. So it was posted NOT because of the negative comments, but because it appears to validate the point that Kate and B&E might not be the best of friends. Try watching without sound. Just because someone couldn't or didn't attend doesn't mean there is tension. I think that's making too much out of it. I was surprised about Charles~ I would have blacked the day out personally but that's me. Legoland's model is super cute. Love that they included so many including Lupo. In the States, a lot of times children have their own first cake to eat, smash etc for the first birthday and everyone else shares a bigger one. Do they do that in the U.K.? If so, wonder what George had? The rumored Nanny Maria cake sounds more like an adult one. Esti, I have to try this! The recipe reads wonderful. But I guess one only deserves the cake after arriving in Santiago de Compostela. Having done the last few meters on ones knees, into the church and exhausted for all eternity. Cake will never taste better. No, I didn't do the Camino, but many of my friends have. Thank you Estibaliz! My daughters have the funniest photos of them smashing their cakes up. I bet if George did as well, the photos would be priceless. Thanks for the great post! So nice to see the family's coming together to celebrate little George's big day. I was so thrilled that the Queen attended and spent almost an hour there. WOW, an hour is a life time in royal time, so she must have been really enjoying herself! I was so surprised to see that Pippa has freckles! I've never seen a picture of her with them, they must be covered by makeup most of the time. I think she looks so much better without all the heavy, dark eyeliner, so much younger. I thought it was very sweet that Kate took George over to see Phillip, I've read that he loves babies so I bet they had a jolly visit. Maybe they took a dip in the BP pool before heading home! (not Phillip, just Kate and George). I LOVED this post Charlotte! Seeing everyone smiling and that even the nanny was smiling made my heart sing. Love that Her Grace showed up with her hair done so nicely: made me miss my grandmother! Wonderful post, thanks for sharing! I guess William must be working in the next few months, (air ambulance or suchlike) or he would have gone to Malta with Kate? Otherwise, it would seem a bit odd for Kate to undertake an overseas engagement alone. Even Diana undertook very few (if any) engagements alone overseas before she was separated from Charles (though she did attend Princess Grace's funeral alone) Changing the subject, the Queen may have been interested to see the changes to her late sister's apartment at Kensington Palace, when she went to George's party. I suppose she attended to show her support for William & Kate. She may not even see George very much. William announced he'd taken the job on George's birthday. It was buried under all the George news which I think was the hope. I think it worked. Thanks for the info on William Bluhare, I hadn't heard that. Doesn't surprise me though. Charlotte, excellent, tasteful coverage of the royal baby's first birthday. As you and others have pointed out, the royals and the aristocracy don't make a big to-do about a baby's first birthday, since it's more a party for the adults than it is the child, who won't remember it. Their practice is not to have a big party and this party, as many have pointed out, was thought up and organized by the Middletons. So I think the criticism of Prince Charles is a little harsh. It may be that he wanted this event to be more for the younger people and Kate and her family and felt his presence would make things awkward or too stilted. Who knows? Charles and William seem to be very close and Charles certainly dotes on Kate, he's paid for her hairdresser on trips abroad and her clothing for the last couple of years. I'd hardly say there was any bad blood between them. The queen is supposedly leaving for her Balmoral vacation in a few days and she'll be there through mid-autumn. Charles and Camilla will certainly be spending time at Birkhall on the Balmoral estate. No doubt they'll see the little prince and his parents then. I will add that if anyone follows any of the Kate accounts on social media, particularly Twitter, or any of the royal reporters (Victoria Arbiter and Richard Palmer are a couple), there's some VERY interesting conversation today (July 23) about the terrible state of affairs at the Buck House press office. Apparently even the most devoted royalist reporters - Palmer once vowed to do naked handsprings if Carole Middleton appeared with the queen at the Christmas morning church service - are furious at the mess the Buckingham Palace press office has become. Seems like both KP and Buck House need PR and media relations help and they need it - ASAP. Things are really falling apart and at a time when positive PR is most needed! To put it mildly things are quite simply a shambles at the press office. It seems the merge was a massive mistake. Between internal squabbles and misleading/flat out lying to reputable members of the press it's really damaging their relationship. Thank you for commenting Charlotte, it certainly seems very messy doesn't it?! They are also failing to keep the Court Circular up to date---up to yesterday they had still not added anything since last Thursday. It's always a probably when you take two fiefdoms and try to merge them. In this case apparently it's turned into Game of Phones! Nanny Maria looks quite different here, fuller in the face. Anon London - Diana made quite a few trips solo overseas, the first was to Norway followed by Brazil, Lahore, Egypt, Pakistan to name a few. Yikes! PLEASE don't start saying that the Nanny's fuller face means that SHE'S pregnant! Maybe she's carbing up chasing after George! Haha! I read somewhere it was Emilia D'Erlanger. Kate's engagment in Malta reminds me of Diana's to Norway which was Diana's first solo royal one abroad other than Grace's funeral. It's a fairly straightforward overnight affair. Simone: I think that the trips that you mention were made after Diana had separated from Charles. The couples separation was announced in December 1992 but her first solo visit was to Norway in feb 84 just before it was announced she was pregnant with Harry. She visited Pakistan solo in 1991, India and Egypt solo in 1992 but I think you could be right about Brazil as she visited with Charles in 91 and solo in 95. Anyway my point it's not exceptional for the females in the royal family to do solo trips and Sophie has done quite a few supporting her vision charity to India and Qatar. I think Diana did go to Germany once during her marriage. Another short trip. It was to visit her regiment. I'm not certain she had any engagments that didn't relate to them. Yes, sorry, Simone, Diana travelled abroad solo before her separation much more than I realised, as you say! My mistake, and apologies to you! This was George's party post. Hope he had a lovely day being doted upon. But please, can we drop the insinuations that Charles is a terrible grandfather because he wasn't there. It was planned to be in the middle of the day and a weekday. That would wipe half the potential guests off straight away. Although I've always struggled to do birthdays during the week unless it's purely for the littlies. Always weekends, and to be frank, not all grandparents or cousins have managed to turn up on the day. Seriously - this is not a big deal! I actually can see Charles spending a lot of wonderful times in the vegie plot with George. This can be just as important as making an appearance for an hour to a party. I find many comments about C & C quite unfair. (Really like the Beulah dress on Emilia from what I can see of it. Didn't think much of it on Kate when she wore it to the wedding. Maybe it's the colouring of a fair haired person, or the hairstyle itself that complements the dress better.. Amazing how the same outfit looks so different according to the wearer). I don't think it's terrible that Charles wasn't there, but at the same time, I cannot imagine that anything would have kept Diana away. It's a pity that he fails to realize that he does have control over his own image. Please let me say AGAIN--esp. Commonwealth-Charles needs to attend AND it likely was planned OVER A YEAR AGO! Prince Charles and Princess Diana were BOTH away when Prince William turned one. Did they celebrate less, or did William feel less loved? We will never know, but I doubt that very much. There was an article in the press at the weekend to say that W&C&G were at Highgrove during the weekend so that George could spend some time with Charles as he could not be there on his birthday as he had a week of engagements in Scotland starting last Monday. Charles probably prefers one on one time with George rather than a bigger gathering. I was surprised when I first heard he wouldn't be at the party but at least it looks like they did spend time together and as George is only one he does not really know what his birthday is. Diana missed William's first birthday, royalfan. Thank you,Helen! I agree with you. Florence and bluhare, yes, Charles and Diana were on a tour of Canada for 18 days. But I doubt that Diana had much input, especially back then. But I'm not overtly critical of Charles for not being at George's birthday party. I think there were several factors involved. Anon from Leo used the term "skirted" and I believe that is an accurate description. Anne - do you have the news source? Diana missed William's first birthday because she had to follow Charles. I do think "the firm" is clueless how this makes them look as a family. Charles wasn't treated any better by his own parents. You know how we keep hearing that William and Kate are going to do things their own way? Well, maybe this is what they are talking about - they are going to put their family above this false "duty" people keep going on about. They are not doctors saving lives or serving in the military or needing to make a paycheck to keep the family home. They go around making PR visits and have complete control over their schedule. I don't think it makes him a bad grandfather - I do think it is bad PR for the family image. If the royal family do not have a "duty" to the public - I wonder why the British and people of the Commonwealth are happy to have them hold an influence on their laws,the Anglican church and even power to dismiss the PM? I'm not clear if your reference is purely to W&K or the royal family overall but, either way the monarchy is bound by a sense of duty. I'm sorry but I do see a duty to their people. They form part of the Commonwealth government and that should mean something. I imagine the Queen and Prince Phillip, (and eventually more royal family) are at the Commonwealth games for a bit of sport? No, they are there as heads of a constitutional monarchy. If there was no sense of duty from the monarchy, we would be a republic. As it so happens, we are not a republic, so we expect public duty from the monarchy. And there isn't so much control over their schedule as you may imagine. Example the Commonwealth games - have to be held in summer. This obviously conflicts with the royal's holiday/respite season. None the less, they have to be there. Schools/hospitals set to be opened on certain dates. I can't see a royal saying they can't make that date 'cos they're off on a shoot. Not good for their image for very quickly word will spread of an uncooperative royal. The monarchy is not just about PR. They have legal and traditional roles they need to uphold. The PR is there probably to convince many skeptics that the monarchy serves a purpose beyond tradition. I think it's admirable that the Cambridge's want to make George's upbringing secure and loved. However, "doing things their own way" shouldn't mean they need to abandon "who" they truly are. I also fail to see why they can only manage a duty to their family. Why not both family and country? I'm sure all those doctors and military people you mentioned above are still bound by a *duty* to their family AND their country. I'm hoping the statement of "doing it their way" has to do with their private personal lives; but this should in no way start to threaten what the people want from their monarch. An that is a sense of *duty*. Jo from USA - Oh so kind of you to comment, thanks for the sympathy. He was and is a rat! The fractured families left behind by the cheater and the step families that are a product of adultery are especially entangled and until I experienced it as a sister/aunt, I did not fully grasp the intense emotions that accompany these situations. So I feel for William and Harry and kudos to them as it appears they forgave Charles for cheating and it appears that they are polite and have accepted Camilla and perhaps they even enjoy a warm relationship with her. Royalfan, Diana managed to take William with her to Australia. I wonder why not to Canada? 18 days is a fair stretch. I would disagree with your premise that the British subjects are happy with the influence. Currently, nobody minds the queen being there because they know she will not mess with the elected parliament, the Anglican Church did not have to deal with the sticky divorce/re-marriage issue of Charles because Diana died - effectively making the way possible for him - so there was no influence there (and only 4 in 10 British subjects belong to it - it is no longer required for subjects to be a member) and the only reason the Queen has the pen-signing legislative power, is so that she can make sure there are no laws to the detriment of her family. These are self-serving powers - not ones to protect the realm. I think Diana may have felt that she saw so little of William in Australia that he was better off at home during the Canada tour. What matters now is that George will benefit from past lessons learned. Thank you for a wonderful post and the opportunity to share in a special day, Charlotte. I'm sure many happy memories were made today with some of the family's nearest and dearest. First birthdays are such fun, and I fondly remember my own three children's parties and their widening eyes and smiles as they tasted their first bites of cake. I can't help but smile just remembering! I imagine Kate has taken some fantastic shots of her baby boy during his first year and that snapshots from today will be cherished forever. I've read that Charles' engagements are sometimes planned up to a year in advance. These also involve other individuals and entities. The family might even have spent the past weekend together celebrating at Highgrove. We don't know. The Lego tribute really is darling - the details really take it over the top! Here's to a healthy and happy second year of life for little George! My guess would be that it was mainly a children's party. Hence Zara, maybe with Mia and Emilia who also has a baby. Not all the godparents seem to have been there. But I wouldn't make much of Beatrice and Eugenie not being there, they have no children and are closer to Harry at least in age. Edward and Sophie are on holiday, just before the traditional Balmoral break and their children are older. Neither Middleton sibling has a job that would stop them from taking time off during the week - or any other time it seems judging from their activities. James has a cake business but it doesn't seem to be going well. I suspect the queen was there out of politeness. She didn't stay too long. She probably enjoys George more when there aren't a lot of people about. But it would bave been discussed - as it is for Charles - if she hadn't come. As for Charles, I can't say. Some people ( including me) have felt uncomfortable with Camilla's presence at all these events like the visiting the hospital after the birth. (The Christening was probably inevitable.) as if she was the grandmother. Maybe Charles skirted that issue by not attending. I never did sort out why Camilla was sitting on some man's knee but only glanced at the article. I see your point more and more about the Camilla factor being a tricky one in George's life Leominster. With Diana's memory fresher than ever, and people wondering and thinking how much she would have loved being a grandmother to William's baby, the thought of "the other woman" being George's step grandma almost makes me cringe as I type. I didn't even know I felt like that. I wonder how William feels about it now, if he is ok with Camilla being there, or if it brings back memories from when he was a young boy, and saw his mother suffer. Yes, her Majesty brought the event to a peaceful equilibrium, and highlighted that the event of the future monarch's birthday was indeed a royal celebration. It does not matter how we feel about Camilla. It matters how George feels about her. I've read many posts here about Camilla and Charles not attending George's birthday party and I just wanted to add my two pennies as well. Personally, I don't think that there are any bad feelings at all between the Cambridges and the Wales. I think that William likes Camilla just fine and appreciates how happy she makes his father. I feel that Camilla is sensitive to the feelings of others and while she might offer a bit of advice I think she would take great care not to step on anyones toes. Of course William misses his mother and wishes that she was still alive to be a wonderful grandmother to her grandson but is mature enough not to continue to hold a grudge. We all seem to have more of a problem with Camilla than William and Harry do and that I believe is a real tribute to their mother. Florence 11:26 I agree that Camilla's adultery was abhorrent. I am sympathetic to your feelings. I have felt lots of sadness and occasional rage at my ex brother-in-law and his mistress for their adulterous affair. He cheated on my kid sister and moved cross country to live with his mistress. He pretended like he was going on a business trip but left her a hand-written note declaring their marriage was over. At the time, they had 4 kids between ages 10 months and 7 years old. In terms of income, he's among the 1%, but his now wife manages the money and she often pays child support late and never has paid any of his share of the kids' medical expenses. He owes my sister at least $100k that he still hasn't paid even though she sued him in court and a judge ruled in her favor. My sister and her 4 kids suffered horribly emotionally and to a lesser degree financially and they still do because of her cheating ex husband. Back to Camilla, it takes two to tango. Help me understand, where is your outrage for Charles who is also guilty of adultery? I'm sure you don't believe he should be distanced from George as punishment. Why focus on Camilla? I am not criticizing you, I really want to understand your feelings. Thanks. I agree, it was Charles that hurt Diana. I don't understand all the Camilla hate either. And Camilla didn't kill Diana, Diana's boyfriend's drunk driver did. Sarah, I had no particular thought on Charles. I was more thinking about how William would feel about Camilla and George, wondering if he misses his mother at this time of George's life. I am not a Camilla hater at all, she seems like a lot of fun to me actually. I just think it would be difficult to accept her as step-grandma, were I William. But I am not, and I don't know them, so it's pure speculation and emotion on my part. I think we can get a bit too black or white in this, where probably the truth lies more in the middle. Just my thoughts, you don't have to agree. Florence 03:47 - Thanks for responding. It was helpful. Truth lies somewhere in the middle - isn't that so often the case. It's good to be reminded of that. And I agree that given all that happened, step into William's shoes and many of us would not accept Camilla as step grandma. I agree that it takes two to tango and I certainly blame Charles as much as Camilla. I have to say though that I think Camilla was far too involved in Charles and Diana's marriage from Day 1. There is substantial evidence that she remained very much involved, trying to make contact with Diana. I frankly think she encouraged the marriage problems, probably by catering to Charles' sense of self-pity. I have to say I don't think highly of her but Charles is paying a huge price in popularity being married to her. It's hard to say how William and Harry really feel about her. For their father's sake they accept her. Can't think George has any opinions yet. The circumstances in the Charles Diana divorce and her death are complex. Certainly a drunken driver was the principle cause but lack of royal security contributed to that. I think that Charles, and probably Camilla may have been behind some very questionable decisions. It would not be reasonable to expect William or Harry to see that though. We haven't yet gotten a book nook going but some books on this topic. "Harry" by Marcia Moody gives a lot of insight into both brothers and Kate and discusses the Camilla issue. I don't know that I buy it all fully but it is a very entertaining book. Just by chance was reading tonight Royal Entertaining and Style by the knowledgeable, although Charles-cetric Ingrid Seward. Got it used. It sheds some light on why Charles may have missed the birthday party. He apparently has no taste for mucky toddlers. She gives an anectdote about Charles and William. When William was a toddler Charles had breakfast with him once when nanny had her day off. Once, it seems, was enough. A Year in the Life of the Queen by Robert Hardman, available used at at least some Waterstones, quite cheap, is written before Kate's was formally in the family but gives a lot of useful information about royal staffing and life and answers a lot of questions I've seen in the last few posts including how the prompt thank you notes are done. It's a very entertaining book I think a lot of regular readers here would enjoy if they haven't read it alreay. Hope Charlotte doesn't mind these mention but I think there is a lot of interest in how the royal family functions. Even King Juan Carlos didn´t want Felipe to got married Letizia, but Felipe said that he was going to give up...........only these days they are in love..
Anon from Leo, exactly my feeling...Camilla was there from Day 1. And as good as she may be for Charles (personally, not popularity-wise) I cannot forget that when I see the perpetual self-satisfied smile. Thank you Lauri as well, I enjoyed reading your perspective. It may very well be so. Leominster - Thanks for the book tips. I made a note about "A Year in the Life of the Queen". I saw a documentary series about QEII possibly with the same title (for her 50th jubilee celebration I think) and loved that. I'm from the US where we make a big deal out of birthdays, especially 1st Birthdays. I'm so pleased to see that George is getting much deserved attention from both sides of his family as well as his godparents. I'm a godmother to my oldest nephew and it is, in my mind, one of the most special bonds you can have with a child. While everyone treats godparent roles differently, attending his birthday is, in my mind, a way of saying, I'm here to be a part of your life in every way I can. As for the endless scrutiny of Prince Charles, I will say this from experience. My brother-in-law lost his mother when he was in his early twenties, just a year before my nephew was born. His father has since re-married and his new wife is referred to by her first name. It's Grandpa John & Anne. This was a choice my brother-in-law made. His decision was based on the fact that his kids have a Grandma but she's in Heaven. They talk about her, look at pictures and know she is watching over them. His father & his wife (not stepmother) are business people and travel for work. They are not at every event or party, but it doesn't mean they love the kids any less. It is strictly based on time and availability. You will never find a time that works for everyone. I'm sure that Prince Charles & Camilla visit and spend time with George and his parents. What Camilla is called by George and her role in his life is a decision that only Prince William can make. He is the one who lost his mother, he needs to make the decision that works best in his heart and mind. As for the Queen, my Grandma has 19 great grandchildren and she tries to go to every event and party but again, it's not always possible. I'd like to think that the Queen & Prince Phillip enjoy time as great-grandparents away from spotlight and speculation. It's not a job, it's a privilege and some things are better left private. I think we need to focus on the fact that George looks like a very happy, healthy little boy. That's really what matters, isn't it? The Lego display was fantastic! I loved it! The corgis and Lupo were too cute! Happy Birthday dear George! Hope your celebrations were fabulous! This family has a history of putting being "royal" above tending to their family's needs - and that is especially true of the Queen. In so far as this family makes its own schedule and have complete control over their appearances - they simply choose not to make George's birthday party a priority. Phillip and Charles chose to be the star of their day - being feted by the public and feeding their egos - Camilla has to follow Charles. This is how the Queen has treated them on their birthdays and they see it as "normal". The Queen scheduled a garden party on Phillip's birthday and Kate had to be requested to come - so he would at least get some press for it. Otherwise the media would have just focused on her other appearance. I don't buy into the "duty" mentality that gets tossed around - this is a family that spends a week at the horse races, relaxes at Balmoral in late summer and early fall, meditates in Sandringham at the beginning of winter, but they can't spare a few moments for a child's birthday? The Middletons, on the other hand, stopped doing business for a day and went to be with George. These folks actually run businesses and decided to give their time and attention to George, putting him first. It's going to get noticeably awkward if Phillip and Charles continue to schedule activities on George's birthday rather then make time for him on that day. This is not to say they aren't going to celebrate in some fashion, probably at Balmoral and George will have another party, but that it is going to look pretty bad for them from a PR perspective. Of course, if they are living in Anmer Hall in the future - no one will be able to figure out who is paying attention to George on his birthday. Meanwhile, I hope Kate has been enjoying her summer vacation. She hasn't had an official appearance since July 5 when she went to watch the cyclists in the Tour de France. I think she is scheduled to "officially watch" some more sports later this weekend? So do you have a problem with them attending sporting event on behave of the Queen? You did not make a big deal when the Queen and the rest of the royal family attending the opening day of the games. I think you just do not like Catherine so you find everything wrong with everything she does. In fairness to the queen, she has done a great many engagements apart from the games this month. Catherine hasn't so there is a difference. Did Moxie say she had a problem with her attending events on behalf of the Queen? I don't think so. I think the point was these are the ONLY events she is attending. The spate of bad press is over and so are the engagements? When armchair gossips like me can spot a pattern it's time to change it up. But to lighten things up for a minute, the queen's photobomb yesterday was, well, the bomb!! I do when people refer to is as "sacrifice" and "duty". I generally don't remark about the entire royal family because this is a blog that focuses on Kate. You are welcome to extend my comments to the rest of the family. Charles was "sacrificing" and doing his "duty" when visiting a squirrel sanctuary on his first grandson's first birthday. Thank God, otherwise the realm would have fallen apart. Of all the things Charles could have highlighted when it was noticed he was not among those at the party at Kensington party, the future King choose squirrels. I checked the court circular to see what Phillip was up to that day, but wouldn't you know it, they've not reported on the happenings on that day. From a public relations perspective, I do think it makes Kate look bad in that all her press engagements in July were focused on sports - Tour de France, Wimbledon, and now the Commonwealth games. She made one brief stop for Place2Be on July 1 and that is her contribution to the realm for the month. Thirty-one days = 3 days watching sports (Wimbledon not included) and 1 visit for charity. Can you count the butterfly photo session as work - when it is you having photos of your family taken to release to the press to celebrate your son? Or is that "family time" since the press weren't invited? Family visit to see butterflies - duty or just fun? Anon 5:35- I do not think Moxie is being totally unfair. She is simply pointing out the differences that you find in a lot of families. I have one set of grandparents who were there for everything and put family first. Then I have the other side of my family who rarely is there for anything due to distance. However, it was very much noted how much more involved the one side was and I suspect we will continue to see that with George's family due to their own reasons. Whether due to egos, family tradition/expectation or what- we don't know but she does have the right to express her opinions and backs them with facts as she sees them. I do not agree with everything she said, but your comment about not liking Catherine and finding fault was unfair. If you disagree with her, try using some more facts to back it up and debate her idea without attacking her- it makes for a better discussion. Moxie, your comparison between duty and the royals' traditional time off is food for thought. Perhaps people don't question that because it has been the norm for decades, yet the idea of establishing a close, loving family unit is a more contemporary approach for the royals (and therefore a good debate topic) . Oh my, what a "storm in a teacup"!! I wonder what would have been said if Charles really had shown up - "wasting public money for a helicopter flight" etc, etc... If you have a look on W&C´s schedule, they will be in Scotland on the 28th, so I guess they will travel this weekend to Balmoral and most certainly have a nice and quiet birthday party with Charles and Camilla. The celebration in London seemed to be especially for the godparents and "younger" crowd to attend (and obviously the Middletons as they live not too far away). I remember my own birthdays when I was little (ok, not my first one, but still.... ;-)) ). If the day happened to be during the week, it was mainly just my family (and I was lucky if my own father was able to be on time for the birthday coffee and cake...), and the "big" celebration with relatives and friends took part on the following Saturday. And I remember my parents telling me that when I was very little they made sure they didn´t invite too many people at the same time but rather "splitted them up" because otherwise I would get upset (as many young children do when all of a sudden the house is full of people and they are all fussing over you- they are just not used to it). That way I was actually able to spend enough quality time with each of them... So personally I think there is nothing to be upset about the way George´s 1st birthday went and/or who was invited/attended.... I´m pretty sure Prince George does not mind having another birthday party in Scotland with Grandpa Chales and Granny Camilla over the weekend!